Introducing the E.M.I.T. 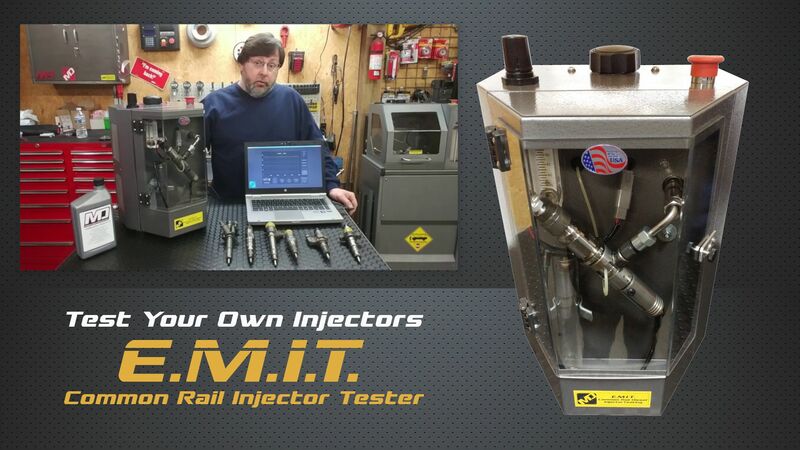 common rail Diesel injector tester. The EMIT runs on compressed air up to 145 PSI, a 120 volt AC or 12-15 volt DC power source. The unit comes with a 120 volt AC to 12 volt DC power adapter. A Windows PC, laptop, or our single board computer are required for operation. Testing pressures up to 220 MPA or 33,000 PSI can be achieved. Test plans for hundreds of injectors are pre-installed in the comprehensive data base. You may also use or generate your own testing plans. The EMIT enclosure is manufactured from 18 gauge steel, and finished with an industrial coating for durability and longevity. We have equipped the machine with an emergency shut down, which also serves to switch the power on. The EMIT features a micro controller that communicates to computer via a single USB connection. The user interface is feature rich, with all the controls laid out in an easy to read and understand arrangement. Pulse count, uSec injector pulse width, cycle delay and MPA setpoint can all be changed to your desired values. The chart area logs the pressure on the screen, showing both current pressure and the recent pressure for about a 20 second span. 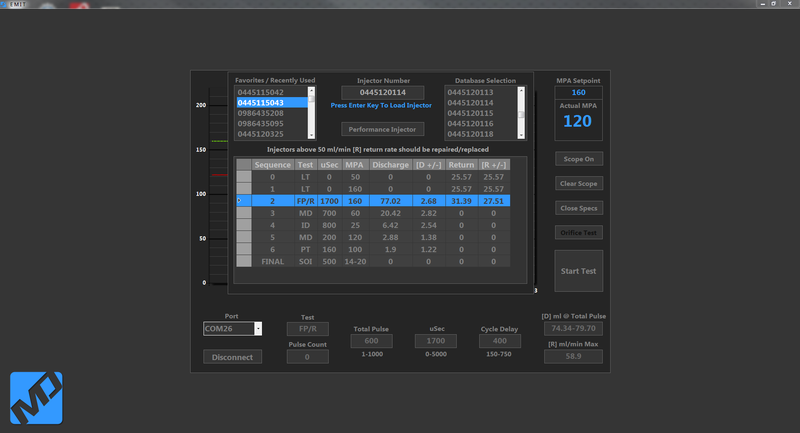 Injector output ranges are automatically scaled based upon the total pulse count defined by the user. 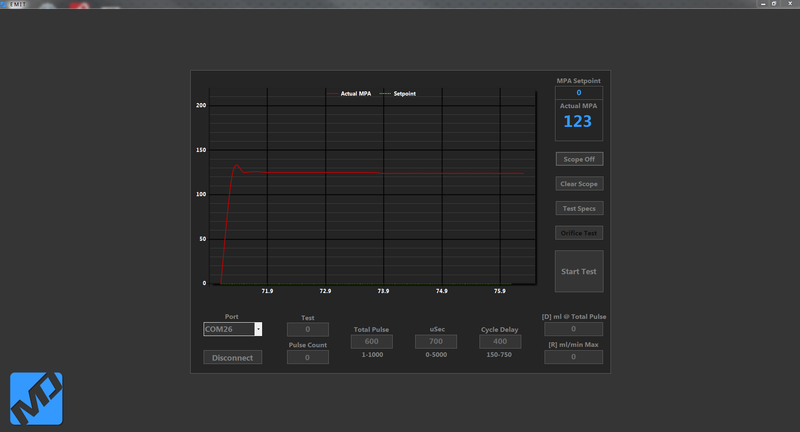 The EMIT can test Cummins 5.9 and 6.7 CR injectors. Duramax LB7, LLY, LBZ, LMM, LML, and LGH injectors. Mitsubishi, Navistar, Freightliner, Ford, Iveco, New Holland, VW, BMW, Mercedes and hundreds of other electromagnetic and piezo injectors as well. The EMIT is a small but powerful tool, weighing in at less than 30 pounds. It requires a very small amount of valuable shop space, and can be easily transported for mobile testing. Put your business into a better position to offer more service options for your customers, and generate more earning potential for your shop. Save your customers from potential breakdowns and costly repairs, by offering injector testing as part of a comprehensive PM testing service.